A plastic croissant! And very realistic fruit. The co-op has business meetings and a seminar one night a month. I missed the one last month due to a vacation, so Gail gave me a little homework to make up for it: cleaning all of the play food and dishes. My son was delighted to have three bags of toys arrive at our house! Also on the topic of cleaning, one of the duties that someone does each day is straightening up after our session, taking out the garbage if necessary, running the vacuum over the carpet, etc. It seems like things get cleaned up pretty well after the snack, and the older kids know how to put things away, so it does not take more than ten minutes. This way, the class that follows starts in a tidy place. This entry was posted in General and tagged daily duties. Teacher Gail reads a Clifford book at the end of our class. We did a mini field trip this week–to the post office! First we all made valentines to send (using lots of stickers, doilies, glitter, and tape), and then we braved the cold and walked to the post office next door. Each of the kids got to put their card into the mail slot. For me, mailing a letter is an uneventful task, but it was exciting for our gang to go somewhere new. This entry was posted in General and tagged field trips. One of the boys in the parachute. Each month, co-op members receive a calendar that notes each week’s theme (this coming week’s is wearing red or green; last week’s was bringing a holiday decoration to show) and assigns us all different tasks, like getting the classroom set up for the day, planning activities for toddlers and preschool-age kids, bringing a snack for everyone, and cleaning up at the end of our class. Last week, I was in charge of the toddler activity. In PEPS we had played with the parachute a couple of times, so I checked with Gail to see if we could do that again. It was really fun! The kids took turns sitting on it while the rest of us shook the fabric around them, and we raised it up over our heads and they all scrambled under as it floated back down. 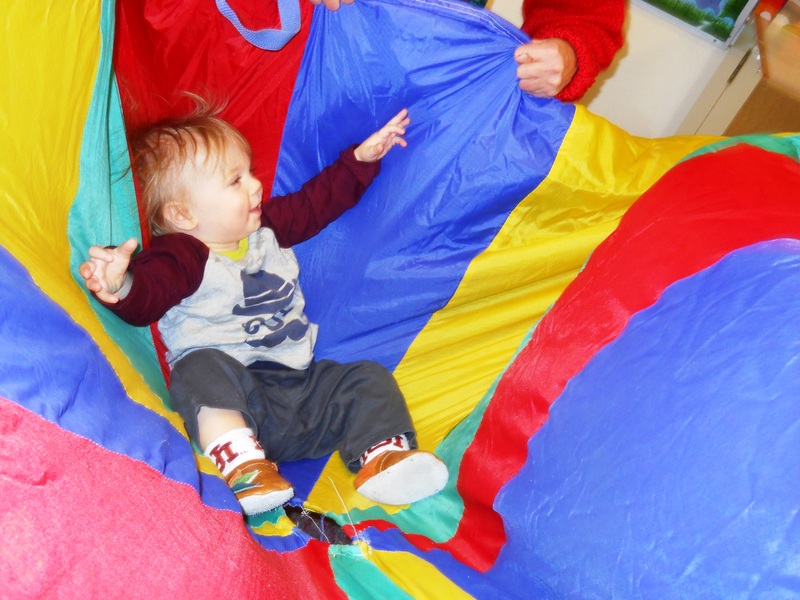 Finally, the kids took turns laying in the parachute while we popped it up and down, and that was a big hit! Remy took two turns, and by the time he was done, his hair was standing on end from the static. Some of the other activities that we’ve done include playing in the water table (Gail has plastic smocks to help with the mess! ), making art with colorful leaves, and singing songs. Everyone’s favorite seems to be going in the romper room, which has two slides, a big inner tube to jump on, a tunnel to crawl through, and some trucks to push around. In the past three months, our kids have raked up the leaves in a nearby park, crafted feathery turkeys, and made Christmas ornaments. More importantly to me, they’re learning how to play together! This is my son’s main source of interaction with other kids, so it’s good experience for him to start learning (slowly, very slowly) how to share. The big kids are just dazzling to him, and he wants to do everything that they do . . . even if it means riding on a big boy’s back in order to participate. Everett, one of the older boys, has been especially caring with the little ones, and played peekaboo with them in the tunnel in the romper room (and didn’t even seem to mind that one of the toddlers was crawling slowly through it). Our monthly seminars have been pretty interesting. Besides housekeeping tasks like voting on a budget and talking about fundraisers, we’ve learned about making environmentally friendly cleaning products, and two parents did a really informative presentation about different methods of saving for college. (Also: we have really good treats at these meetings. Especially the maple cookies we had the first month!) We missed the Halloween party but are looking forward to the upcoming holiday gathering, where Santa will pass out books to the kids. The pink stoller has been a hit with my son, who recently started walking. We’ve got really fun costumes for the kids to wear, from the Blanche Devereaux-inspired vest shown here to fireman’s helmets and hardhats. Teacher Gail brought her apple corer, which everyone had fun trying. We experienced how different the varieties of apples (and one Asian pear) taste. In September, the co-op had a field trip to Greenbluff and took a tour of an orchard. One friend rakes leaves into a pile for his buddies to jump (or crawl) into! More fun in the leaves! This boy filled up his wagon with leaves, while other friends look on and one of the girls plays around. This was a really beautiful day. Teacher Gail supervises my son in the kitchen. 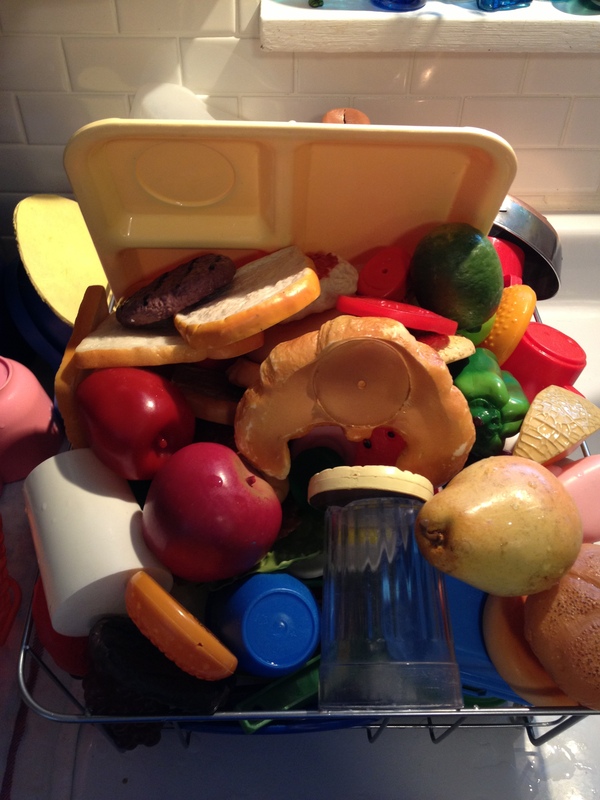 We’ve got lots of play food, including a plastic croissant! This entry was posted in General, seminars and tagged Daily activities, field trips. Two new friends on the first day of the co-op. 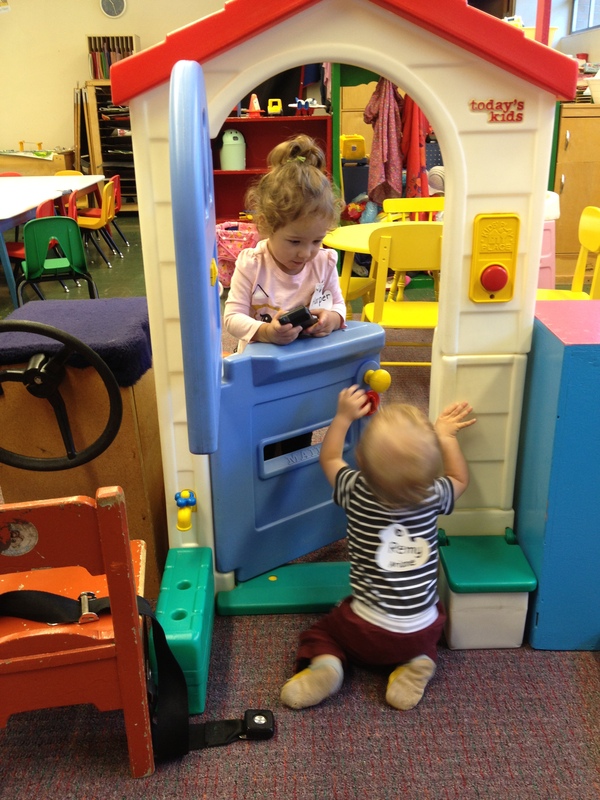 This doorway is a very popular spot in our classroom, especially with the littlest kids. Unless otherwise noted, photos are by Ariane Smith. Our first day of co-op was pretty fun. To start, we all sat on the carpet and introduced ourselves, then sang songs like “The Wheels on the Bus” and “Mary Had a Little Lamb.” Next was either some play time or an activity (the activity involved sitting at a table and using paint–too much for a ten month old–so my son played with the fantastic front door shown here). There are three little ones around twelve months old, plus six other kids whose ages range from two to four. Our day has mostly moms, but one grandma comes every other week, and there are dads who come on other days. The two little PEPS kiddos were able to sit in the little chairs and have most of the snack with their new buddies. Remy’s not the neatest drinker, but it’s good experience for him to be around big kids and see how they behaved. The second half of our class was in the romper room! The kids raced around, jumping on the inner tube, crawling through a tunnel, and climbing up the ladder for the slide. At the end of our time, we sang the good-bye song and high-fived Teacher Gail. My son fell asleep in the car within about thirty seconds–an amazing, stimulating morning had worn him out! This entry was posted in General and tagged Daily activities. 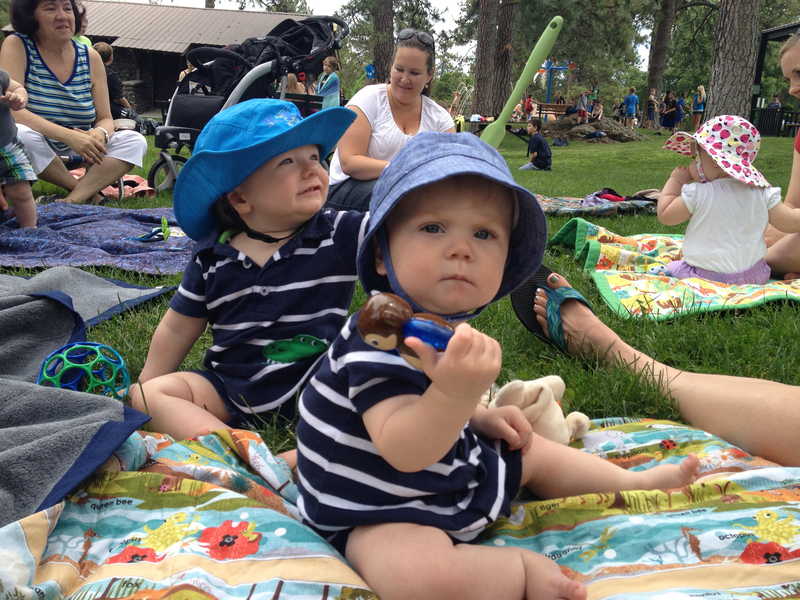 Two little buddies, 27 June, at a PEPS meeting at Manito Park. Their similar outfits are just a coincidence! Photo by Lindsay. I started in PEPS (Program for Early Parenting Support, for infants up to ten months old) in January of this year, when my son, Remy, was two months old. There were two other baby boys in the group then, but by the time August rolled around, our group had grown to five little boys and two girls. 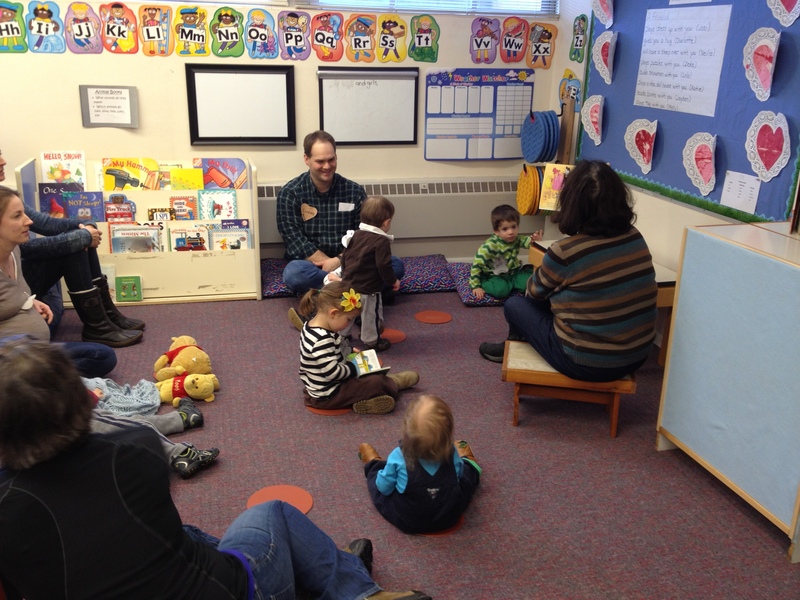 Each week, we discussed what was new with our babies and any problems that we were having. Of course, sleep was a pretty popular topic for quite a while, but eventually (finally!) the conversations moved to what everyone was eating–when we could move on from steamed zucchini to crackers and why yogurt was ok but milk was not. (PEPS has served as quite the brain trust.) We also sang a lot of songs–Teacher Gail made me do a solo on our first day, which I’m sure was memorable for everyone–and recited nursery rhymes. PEPS made what could have been a cold, lonely winter into one with friends. Gail passed out articles on child development with us about every other week, and we did activities like making Valentines with our babies’ foot- and handprints, bringing our favorite books, and playing with the parachute. We celebrated every tiny milestone, from Henry saying ‘Daddy’ on his very first Fathers Day to Davis’s going to the beach and Barrett swimming underwater. One day, Davis popped up onto his knees to crawl for the first time, and Remy did it the exact same way the very next day–he must have learned from Davis’s example! It was so remarkable to see how the boys changed–now they’re piling on each other, trying to ride each other like horses, and charging after the best toys. Now the babies have grown up and are official members of the co-op! I’ll be writing posts every month or so about what we’ve been up to. This entry was posted in General, PEPS and tagged infants.